A polymer modified asphalt emulsion based driveway resurfacer designed to beautify and protect asphalt pavement surfaces. Fortified with sand for ultimate filling, non-skid protection and longest life. Made with an Advanced No-Stir Gel Formula. This driveway resurfacer is great for heavy traffic areas and dries to a rich black finish. 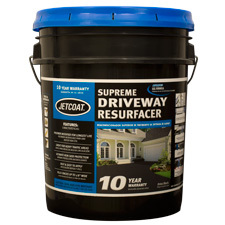 JETCOAT Supreme Driveway Resurfacer is packaged ready to use. No stirring is necessary. With pavement still damp, apply a uniform coat of sealer, being sure to avoid heavy or uneven application which may result in cracking or tracking. A second coat should be applied after the first coat has dried “to the touch” or within 24 hours at stated coverage rate. A rubber squeegee or brush is recommended for application. Depending on pavement porosity, coverage will vary from 250-350 sq. ft. per pail. 25765 4.75 gal. Pail 57.5 lbs.